Last month Dan, Danielle and I trekked down to Chatham, Ontario to collect some samples for the freshwater mussel project that I’ve been working on for the last year. 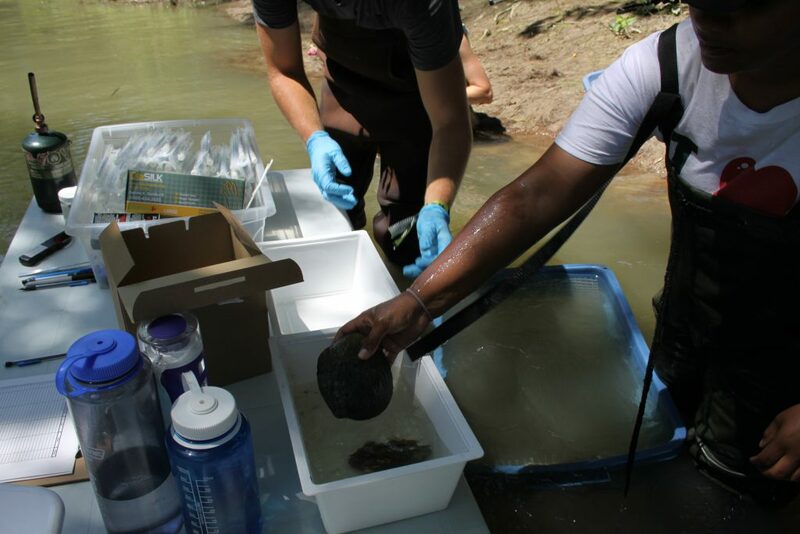 We collaborated with the Department of Fisheries and Oceans as they were working on monitoring the mussel populations for their projects and were able to help us find and ID the mussels. We arrived on July 27th, and after getting into our waders we got ourselves set up in the river. Luckily for us the DFO crew had collected specimens for us so after going over some quick IDs we started sampling. Like I mentioned in my last blog post, we were testing the use of swabs to collect DNA from the mussels, in order to build the reference library without harming the mussels. After spending the day working in a conveyor belt style system, the three of us had gotten it down to a science and were able to sample a lot of specimens in a short amount of time. The next day, we joined the DFO crew earlier and helped them with their surveys. Using viewing boxes we found the mussels and collected them, soaking ourselves in the process. The DFO was collecting mussels to ID and measure them for their databases so once they had finished with them we began sampling for our project. During our time in the field I was able to pick up some tips from the DFO crew on how to properly handle the mussels in order to reduce stress. 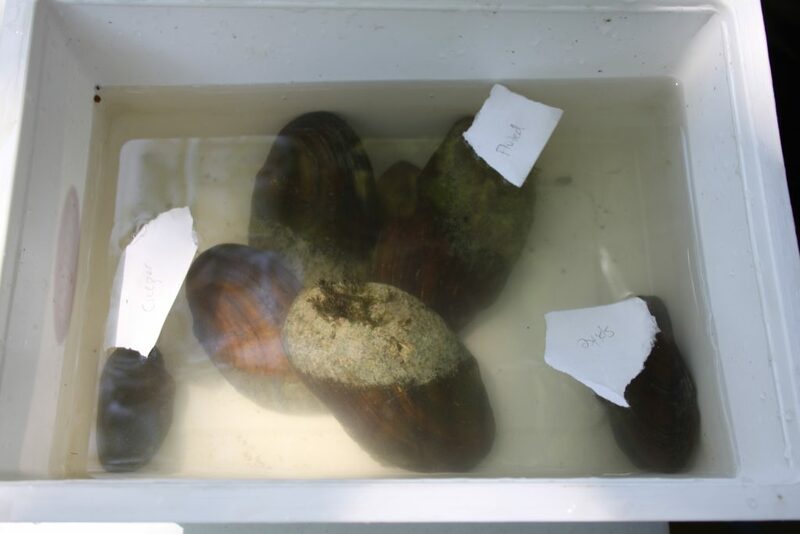 We kept the mussels out of direct sunlight in flow through bins submerged in the water. These flow through bins were kept upstream in order to prevent any debris that we kicked up from flowing over the bins. We also had to ensure that any metal tools (such as forceps) were not still hot after flame sterilization. Finally we returned the mussels back into the river in the general area and substrate type that we found them in. After two days of sampling we completed enough samples to fill 3 plates. 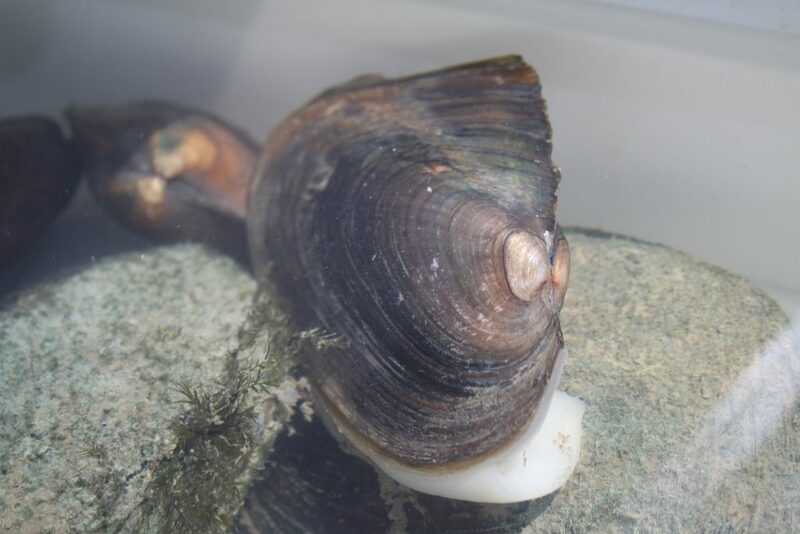 Overall we collected samples from 141 individuals over 20 species which is amazing considering that there are 41 species of freshwater mussels found in Ontario! 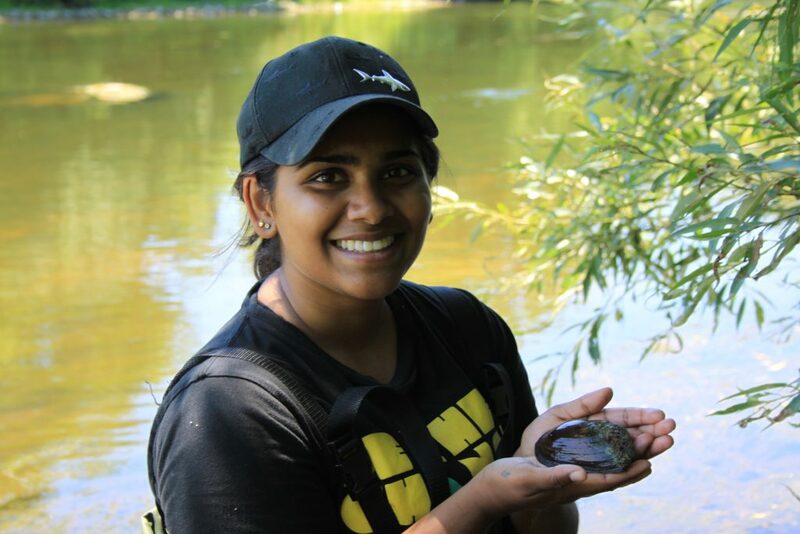 We’re in the process of getting sequences from these samples, but in the meantime Kara Layton will be giving a presentation about the freshwater mussel project at the International Barcode of Life Conference. The conference is happening this week in Guelph will be a great opportunity to tell other researchers about our work, and get feedback about what we’ve been doing. The conference comes at a great time because sadly, I am currently finishing up my last week at BIO and it’s a fun way to end my time here. It’s crazy to think that when I started I didn’t know how to ID mussels, or even what DNA barcoding was. I’ve learned so much I am appreciative for the opportunity to be a part of some of the most cutting edge research in the world. I’d like to use my blog to thank everyone at BIO that answered my questions, taught me how to do everything and encouraged me over the last year. All of you helped me grow so much and I will always be grateful. Oh, and I’d like to thank all the mussels I sampled for their contribution to science, I really couldn’t have done it without them! Long time no blog. We have been super busy here at BIO in the past few weeks. Between field work, the rare BioBlitz, and the Barcoding Conference, it has been pretty crazy here lately! There will be lots of blogs coming your way from our staff about all these fun topics. I myself have been doing a lot of night collecting in the form of Bucket Traps and Night Sheets. The names of these traps leave a lot to the imagination so I will explain further. Night collecting is done as the name suggest, at night. This allows you to use light as an attractant to lure in all the creepy crawlies that prefer roaming in the dark. Bucket traps are actually a little more complicated than the name implies. 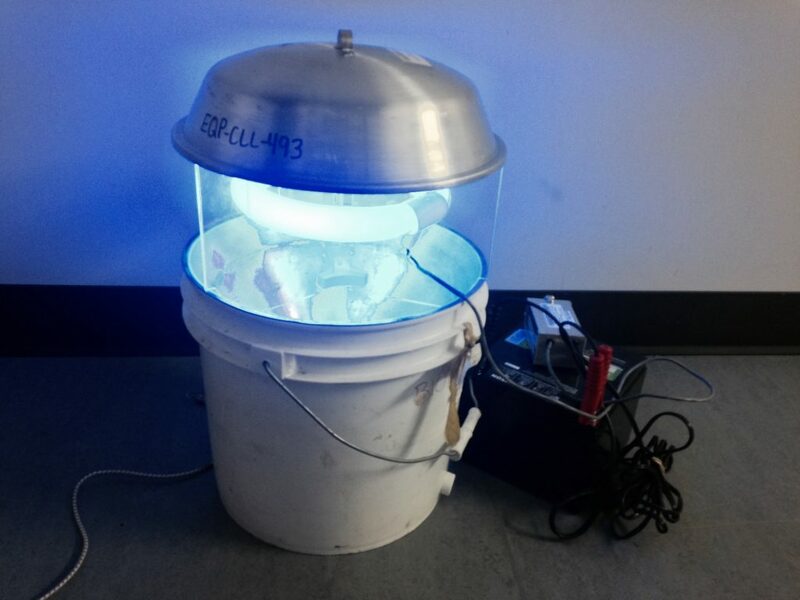 To set this up correctly, you need a large bucket, a funnel that fits in the bucket, a black light, a power source, a jar of ethyl acetate, and a piece of sponge. Sounds like a lot of random equipment, but I promise it all comes together. The black light is propped up above the bucket. Below the light is the funnel which is situated in the bucket. Inside the bucket is the jar of ethyl acetate with a small hole in the lid. The piece of sponge is put through the hole in the lid, submerging half of it into the ethyl acetate with the other half exposed to the air inside the bucket. The trap is usually placed in an area with a lot of visibility such as a field or an open forest. The moths see the light from all around during the night and fly to it. Once they get to the light, they take in the fumes from the ethyl acetate. They then get dizzy and fall down through the funnel, which there they usually die. 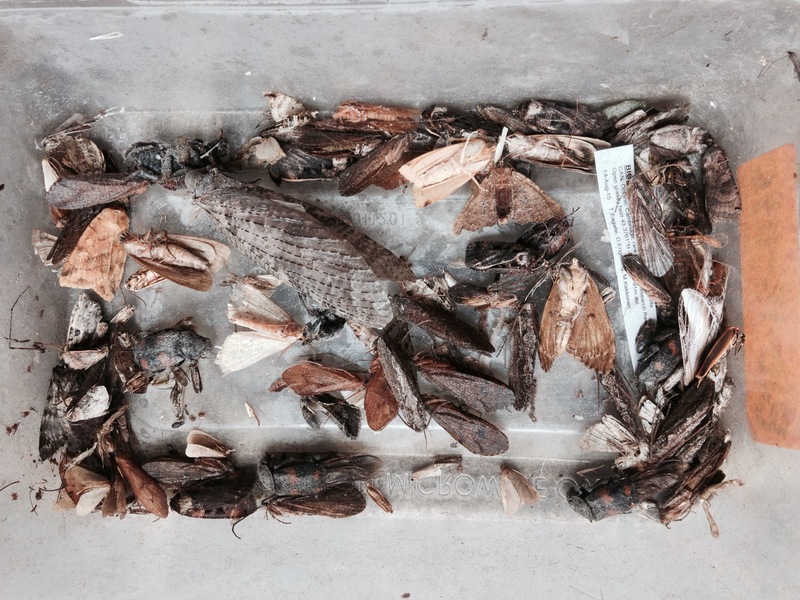 Then in the morning we collect the moths and bring them back to BIO! The night sheets work in a similar way except there are people there to collect the specimens off of the sheet instead of killing them with ethyl acetate. There is a flexible pole situated in an arc that you attach a white sheet to. Then you anchor it with some string and tent pegs. A light is situated on one side of the sheet which attracts all kinds of flying insects. The night sheet does well in similar places as the bucket traps. The more the visible the light is, the better. The bucket traps were all done previous to the Sunday of the Bioblitz in order to have some specimens for experts to look through during the day. The night sheets were set up for the experts to actively collect on the Sunday night. 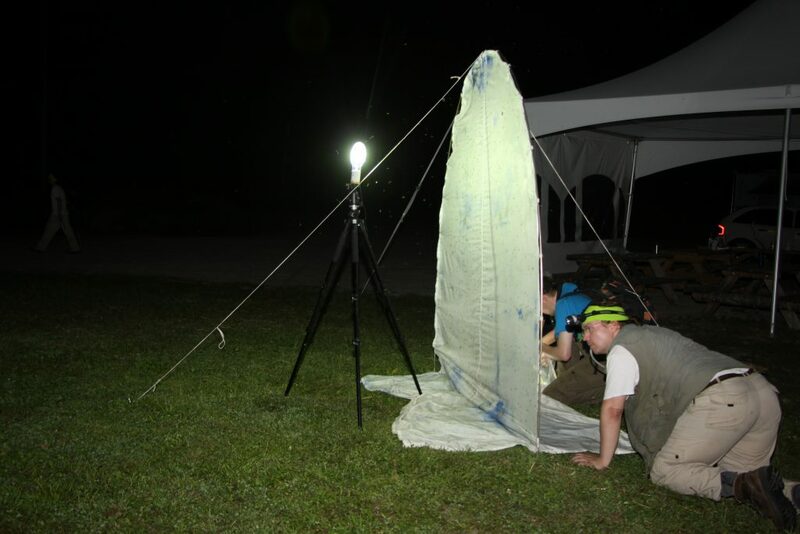 We had 9 separate night sheets set up all over rare for the Bioblitz, so we sure attracted a lot of specimens! That’s it for me this week. Stay tuned to see what everyone else at BIO has been up to the past couple of weeks. There should be some good ones coming your way!